The international youth basketball season for 2010 is about to start for France U16 with the U16 Tournoi International du Poinçonnet. 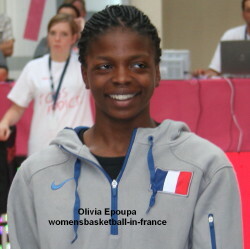 France won the tournament in 2009 with Bourges Basket player Margaux Galliou taking the MVP award. Spain won the tournament in 2008 and are the only team from the 2009 addition. Belgium and Poland are the two other teams that will take part. The tournament takes place during the Easter Holiday from Saturday, 3 April 2010 until Monday, 5 April 2010. Jérôme Fournier is the head coach of the U16 this year and is assisted by Pierre-Olivier Croizat and former French international Nathalie Lesdema. 18 players have been called up by the French Basketball Federation. Olivia Epoupa (right) is the only member of the training roster that participated in the U16 European Championship last season. However this is her first participation in Poinçonnet. Valériane Ayayi and Lidija Turcinovic were also members of the 2009 training roster.